West Virginia State Board of Education v. Barnette, 319 U.S. 624 (1943), is a landmark decision by the United States Supreme Court holding that the Free Speech Clause of the First Amendment protects students from being forced to salute the American flag or say the Pledge of Allegiance in public school. The Court's 6–3 decision, delivered by Justice Robert H. Jackson, is remembered for its forceful defense of free speech and constitutional rights generally as being placed "beyond the reach of majorities and officials". West Virginia State Board of Education, et al. v. Walter Barnette, et al. The Free Speech clause of the First Amendment prohibits public schools from forcing students to salute the American flag and say the Pledge of Allegiance. District Court affirmed. Barnette overruled a 1940 decision on the same issue, Minersville School District v. Gobitis, in which the Court stated that the proper recourse for dissent was to try to change the public school policy democratically. It was a significant court victory won by Jehovah's Witnesses, whose religion forbade them from saluting or pledging to symbols, including symbols of political institutions. However, the Court did not address the effect the compelled salutation and recital ruling had upon their particular religious beliefs but instead ruled that the state did not have the power to compel speech in that manner for anyone. In overruling Gobitis the Court primarily relied on the Free Speech Clause of the First Amendment rather than the Free Exercise Clause. In the 1930s, the government of Nazi Germany began arresting thousands of Jehovah's Witnesses who refused to salute the Nazi flag and sent them to concentration camps. Jehovah's Witnesses teach that the obligation imposed by the law of God is superior to that of laws enacted by temporal government. Their religious beliefs include a literal version of Exodus, Chapter 20, verses 4 and 5, which says: "Thou shalt not make unto thee any graven image, or any likeness of anything that is in heaven above, or that is in the earth beneath, or that is in the water under the earth; thou shalt not bow down thyself to them nor serve them." They consider that the flag is an 'image' within this command. For this reason, they refused to salute the flag. In the United States, children of Jehovah's Witnesses had been expelled from school and were threatened with exclusion for no other cause. Officials threatened to send them to reformatories maintained for criminally inclined juveniles. Parents of such children had been prosecuted and were being threatened with prosecutions for causing delinquency. In 1935, 9-year-old Carlton Nichols was expelled from school and his father arrested in Lynn, Massachusetts, for such a refusal. Additional refusals followed, one such leading to Minersville School District v. Gobitis (1940). Even after the Gobitis decision, Jehovah's Witnesses continued to refuse to say the pledge. Following the Gobitis decision, the West Virginia Legislature amended its statutes to require all schools in the state to conduct courses of instruction in history, civics, and in the Constitutions of the United States and of the State "for the purpose of teaching, fostering and perpetuating the ideals, principles and spirit of Americanism, and increasing the knowledge of the organization and machinery of the government". The West Virginia State Board of Education was directed to "prescribe the courses of study covering these subjects" for public schools. Students pledging to the flag with the Bellamy salute, March 1941. Failure to comply was considered "insubordination" and dealt with by expulsion. Readmission was denied by statute until the student complied. This expulsion, in turn, automatically exposed the child and their parents to criminal prosecution; the expelled child was considered "unlawfully absent" and could be proceeded against as a delinquent, and their parents or guardians could be fined as much as $50 and jailed up to thirty days. Marie and Gathie Barnett[nb 2] were Jehovah's Witnesses attending Slip Hill Grade School near Charleston, West Virginia, who were instructed by their father not to salute the flag or recite the pledge, and were expelled for their refusal. On the advice of an early attorney, Mr. Horace S. Meldahl of Charleston, the Barnetts had avoided the further complications by having their expelled girls return to school each day, though the school would send them home. Ordinarily we would feel constrained to follow an unreversed decision of the Supreme Court of the United States, whether we agreed with it or not. ... The developments with respect to the Gobitis case, however, are such that we do not feel that it is incumbent upon us to accept it as binding authority. The school district subsequently appealed. 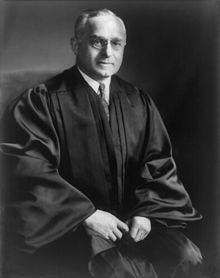 The board's argument was that the plaintiffs raised no substantial federal question, and their brief relied extensively on Justice Frankfurter's Gobitis opinion. Hayden Covington answered the state's appeal in a brief that was a mixture of Jehovah's Witnesses Bible teachings and Constitutional arguments. He explicitly called for the overturning of the Gobitis opinion, especially rejecting Justice Frankfurter's deference to legislative policymaking authority. Such deference, he argued, allowed the legislature to define its own powers. He emphasized the nationwide persecution of Jehovah's Witnesses that had followed Gobitis and concluded with a long list of law journal and newspaper articles that criticized the decision. The American Bar Association's Committee on the Bill of Rights and the American Civil Liberties Union filed amicus curiae briefs that argued Gobitis was bad law and should be overruled. It was widely expected that Gobitis would be overturned. The resignation of James Byrnes the previous year, and Franklin D. Roosevelt's subsequent appointment of Wiley Rutledge, had created a shift on views of the First Amendment—for instance, the Court overturned a precedent set a mere nine months prior in Jones v. City of Opelika (1942) through its ruling in Murdock v. Pennsylvania (1943). The Supreme Court announced its decision on June 14, Flag Day. The opinion that Justice Felix Frankfurter had authored three years earlier in Gobitis rested on four arguments. In Barnette Justice Jackson addressed each element of Frankfurter's Gobitis decision. Jackson began with Frankfurter's designation of the flag as a national symbol. He did not question Frankfurter's designation of the flag as a national symbol; instead, he criticized the pedestal on which Frankfurter put such national symbols. Jackson called symbols a "primitive but effective way of communicating ideas", and explained that "a person gets from a symbol the meaning he puts into it, and what is one man's comfort and inspiration is another's jest and scorn". Next Jackson denied Frankfurter's argument that flag-saluting ceremonies were an appropriate way to build the "cohesive sentiment" that Frankfurter believed national unity depended on. Jackson rejected Frankfurter's argument, citing the Roman effort to drive out Christianity, the Spanish Inquisition of the Jews and the Siberian exile of Soviet dissidents as evidence of the "ultimate futility" of efforts to coerce unanimous sentiment out of a populace. Jackson warned that "[t]hose who begin coercive elimination of dissent soon find themselves exterminating dissenters. Compulsory unification of opinion achieves only the unanimity of the graveyard." Two of the justices who changed their minds between Minersville and West Virginia v. Barnette—Hugo Black and William O. Douglas—would become the most ardent supporters of the First Amendment. Words uttered under coercion are proof of loyalty to nothing but self-interest ... Love of country must spring from willing hearts and free minds, inspired by a fair administration of wise laws enacted by the people's elected representatives within the bounds of express constitutional prohibitions. Three years earlier seven justices had followed Frankfurter's reasoning and joined his majority opinion in Gobitis. In Barnette however, only Frankfurter filed a written dissent, while Justices Owen Roberts and Stanley Reed dissented in silence. Frankfurter said that the court was overstepping its bounds in striking down the West Virginia law. He said, too, that freedom of religion did not allow individuals to break laws simply because of religious conscience. Frankfurter argued that "Otherwise each individual could set up his own censor against obedience to laws conscientiously deemed for the public good by those whose business it is to make laws." Frankfurter's response to Jackson's systematic destruction of his Gobitis decision was one of anger, and Justices Roberts and Murphy tried to get him to revise his opinion, arguing that the first two lines were "much too personal". However, Frankfurter ignored the advice of his fellow justices, taking the overruling of his Gobitis decision as a personal affront and insisting on speaking his mind. Frankfurter began with a reference to his Jewish roots: "One who belongs to the most vilified and persecuted minority in history is not likely to be insensible to the freedoms guaranteed by our Constitution." This was the passage Justices Roberts and Frank Murphy felt was out of place. Frankfurter, however, insisted that the passage was necessary since he claimed he was "literally flooded with letters" following the Court's decision in Gobitis that said he should be more sensitive to the protection of minorities due to his Jewish heritage. Frankfurter's dissent continued, "Were my purely personal attitudes relevant I should wholeheartedly associate myself with the generally libertarian views in the Court's opinion. ... But as judges we are neither Jew nor Gentile, neither Catholic nor agnostic." Having responded to his critics and the Court's reversal on a personal level, he now responded on a judicial one, with the remainder of his opinion focusing on judicial restraint. "As a member of this Court, I am not justified in writing my private notions of policy into the Constitution. ... It can never be emphasized too much that one's own opinion about the wisdom or evil of a law should be excluded altogether when one is doing one's duty on the bench." Frankfurter continued, arguing that if the Court is frequently striking down laws it is circumventing the democratic process since the Court cannot work to reach a compromise. It either strikes down a law or lets it stand; it cannot simply modify or qualify a law as a legislature can. Finally, Frankfurter rejected Justice Stone's rational basis test that Stone laid out in United States v. Carolene Products Co. (1938). Instead, Frankfurter focused on his belief that there were no provisions within the constitution that occupied a "preferred position" over others. The majority opinion in Barnette is considered one of the Court's greatest and most sweeping statements about the fundamental freedoms established by the Bill of Rights. After Barnette the Court began to turn away from the belief-action doctrine altogether, creating a religious exemption for believers of different creeds. In Sherbert v. Verner (1963), for example, the Court upheld a Seventh-day Adventist's claim to unemployment benefits even though she declined to make herself available to work on Saturday (her Sabbath) as the law required. In Wisconsin v. Yoder (1972), the Court upheld the right of Amish parents not to send their children to public schools past the eighth grade. At 2006 proceedings cosponsored by the Justice Robert H. Jackson Center and the Supreme Court Historical Society, Supreme Court law clerks from that Court were on a panel with the two eponymous Barnetts. Just as she and her sister had been in 1942, Gathie Barnett Edmonds noted that her own son was also sent to the principal's office for not saluting the flag. ^ This was the wording of the pledge at the time; the words "under God" were added later, in 1954. ^ Johnson, John W. (2001). Historic U.S. Court Cases: An Encyclopedia. Taylor & Francis. p. 953. ISBN 978-0-415-93756-6. Though the Flag Salute Cases are generally seen as involving freedom of religion, that issue is virtually absent from Jackson's majority opinion. He accepted, without question, that the Jehovah's Witnesses sincerely held beliefs which made it impossible for them to conscientiously salute the flag. But Jackson did not offer any analysis of the importance of that belief or even of the role of religious freedom in striking down the mandatory flag salute. Rather than grounding his opinion in terms of freedom of religion, Jackson analyzed the case as one of freedom of speech and expression. ^ Hanstein, Woody (January 16, 2013). "From the Bulldog's Desk: A lesson on patriotism from a 9-year-old boy". The Daily Bulldog. Moderator: What was your parents' decision about how to handle this situation: The school has a mandatory flag salute, thanks to the State Education Department regulation, and you have your religious belief? [Gathie Barnette] Edmonds: When we went home, of course, they understood and they said not to worry about it. And our uncle helped us get a lawyer, Mr. Horace Meldahl in Charleston, who was a very understanding person, a nice person. He told us that we had to go back to school every morning for a while. Edmonds: So they wouldn't fine our dad or put him in jail. [Marie Barnette] Snodgrass: So they couldn't say we were just being truant. And so we went every morning and stayed until the flag salute, and they'd tell us to go home. It was fortunate that we lived fairly close—we didn't have a long distance to go. Moderator: And that was the end of the school day for you? Edmonds: Yes. Once the truant officer came and asked my mother why we weren't in school, and she could say, "Well, we sent 'em and they sent 'em home." So that kind of took, you know, the edge off of them. Our parents didn't keep us home. ^ Hudson, David (December 28, 2009). "Woman in Barnette reflects on the famous flag-salute case". First Amendment Center. ^ West Virginia State Board of Education v. Barnette , 319 U.S. 624, Majority Opinion, item 3 (US 1943). ^ "Article: Recollections of West Virginia State Board of Education v. Barnette". St. John's Law Review. Vol. 81 no. 4. Fall 2007. p. 792 (38/42). From April 28, 2006 proceedings cosponsored by the Robert H. Jackson Center and the Supreme Court Historical Society, at the Jackson Center in Jamestown, New York, "[The older of the two Barnett girls, Gathie Barnett] Edmonds: ...I remember when my older son was sent to the office for not saluting the flag. The principal came back and said your teacher obviously doesn't remember the Supreme Court decision." Alley, Robert S. (1999). The Constitution & Religion: Leading Supreme Court Cases on Church and State. Amherst, NY: Prometheus Books. pp. 428–436. ISBN 1-57392-703-1. Irons, Peter H. (1999). A People's History of the Supreme Court. New York: Viking. ISBN 0-670-87006-4. Kommers, Donald P.; Finn, John E.; Jacobson, Gary J. (2004). American Constitutional Law. Vol. 2 (2nd ed.). Lanham, MD: Rowman & Littlefield. ISBN 0-7425-2688-7. Sandmann, Warren (2003). "West Virginia State Board of Education v. Barnette". In Parker, Richard A. Free Speech on Trial: Communication Perspectives on Landmark Supreme Court Decisions. Tuscaloosa: University of Alabama Press. pp. 100–115. ISBN 0-8173-1301-X. What We Owe Jehovah's Witnesses, by Sarah Barringer Gordon, April/May 2011 American History magazine; article on Barnette's effects on Constitutional Law.